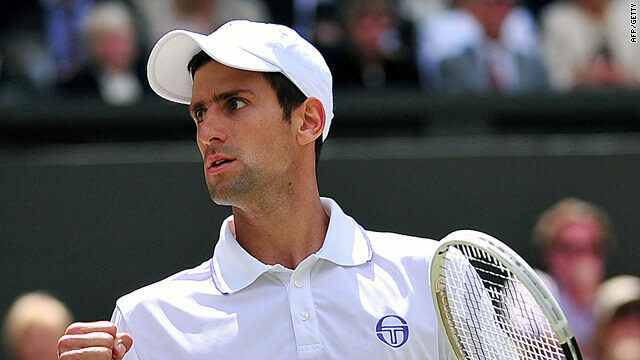 A fired up Novak Djokovic on his way to a four-set victory over Jo-Wilfiied Tsonga on Centre Court. (CNN) -- Novak Djokovic and Rafael Nadal will contest the Wimbledon final after both secured battling four sets victories in their semifinals Friday. Djokovic beat France's Jo-Wilfried Tsonga and will take over from Nadal as world number one, whatever the outcome of Sundays' showpiece. Nadal stayed on course to defend his crown with a later 5-7 6-2 6-2 6-4 victory over home hope Andy Murray in their semifinal. French Open champion Nadal trailed Murray by a set and looked set to surrender his own service again before the fourth seed missed a easy forehand winner. It signaled a turning point as the Spaniard won the next seven games to take a stranglehold on the contest he never relinquished. Earlier, second seed Djokovic secured a 7-6 6-2 6-7 6-3 win in just over three hours, snuffing out any hopes of a comeback for Tsonga, who saved two match points before claiming the third set on a tiebreak. Tsonga had fought back from two sets down to beat six-time champion Roger Federer in the quarterfinals, but there was to be no repeat. Djokovic responded by breaking Tsonga in the second game of the fourth set and made no mistake when he served for victory for the second time. "It's difficult to put into words," said Djokovic after his win. "This is one of the best feelings I've had on a tennis court. My dreams are coming true -- into my first final at Wimbledon. "I've been working all my life for this. I've been dreaming about playing the final in Wimbledon since I started playing tennis when I was four, so to be there in the final on Sunday will be fantastic." The 24-year-old Djokovic has reached the summit of the men's game after an incredible 2011, which has seen him beaten just once, at the French Open by Federer. He claimed the Australian Open title in January and four Masters series crowns, beating Nadal in each of the finals. But title holder Nadal has a tremendous record at the grass court grand slam, winning three of the last four championships, only missing out in 2009 as he was sidelined by injury. His comeback against Murray showed again his incredible fighting abilities although he had considerable sympathy for his beaten opponent. "He deserved to be in this final too. It's tough for him to lose this match today but I wish him all the best for the rest of the year, especially for the U.S. Open," Nadal told BBC Sport.